Points are accumulated in a series of designated races in or not far from Albuquerque. The designated races include the following categories: 5K, 10K, half-marathon, and marathon on road courses, plus a “short” trail run, and a 50K or 50 mile ultra. For each category of race there are several options so that competitors have a chance to avoid problems for entry, such as field size limitations, schedule conflicts, etc. The best scores of a competitor in each of the categories in which he or she has a result will be added to determine standings. A runner may take part in more than one race in any category but only an individual’s best score counts. Points are awarded only relative to performance of other ARR runners in the competition who are in the same race, not relative to the field at large. Points are awarded according to the formula: points = 1/n where n is the finishing rank relative to other ARR members competing in the series in the given race. The competition extends over a calendar year. Competition is divided into 10-year age groups except for the oldest and youngest: ( 0-19, 20-29, 30-39, 40-49, 50-59, 60-69, 70-79, 80+ ), female and male. Members moving up an age group during the year will belong to the higher age group if their birthday falls before July 1. Thank you to all of this year's participants, and congratulations to our first place age-group winners! ​Any ARR member interested in participating is eligible without any further entry fee, but participants must register their interest with the Series Coordinator, Ian Maddieson, and provide name, date of birth, and gender. Find out how to join here! 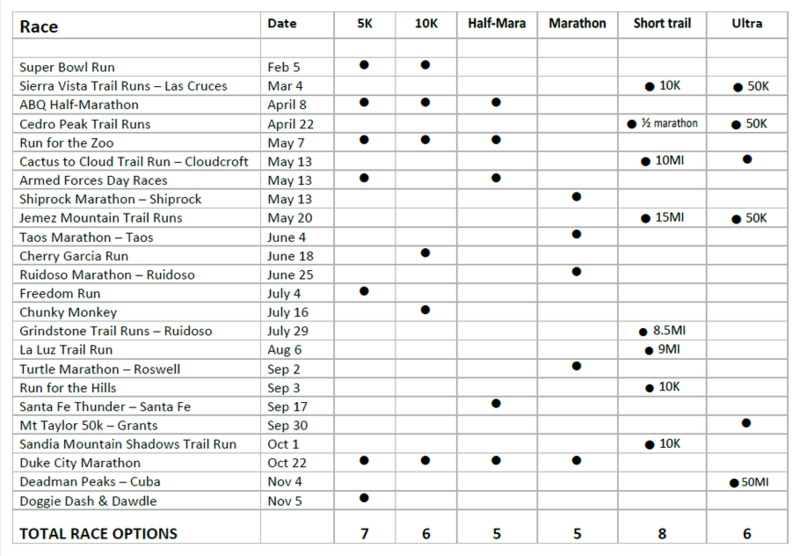 ​Race distances other than those listed do not count. ​Races are in Albuquerque unless otherwise noted.